Yesterday I met with Christopher Engman, CEO of Vendemore. Christopher built his company 9 years ago and has delivered hundreds of enterprise deployments around the globe. In this history, he has formed a solid point of view around the value of Account Based Marketing to deliver success in cross selling and up selling existing accounts within an organization. Christopher views this as the great untapped opportunity for marketers. 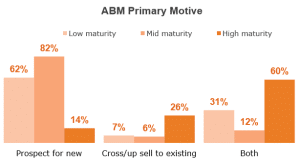 To achieve this, marketers need to think and act in very focused and deliberate ways… pointing their ABM efforts to address specific account level needs, thinking beyond acquisition and activity based metrics. In this discussion, we discuss the rationale for cross sell and up sell, as well as the indicators that this strategy may indeed be the right one for your organization.